Wagons are cool, right? There’s a definite trend towards practicality among new car buyers in the UK. Just look at the success of crossovers, and we’re increasingly buying more estates than conventional D-segment saloons. But, until now, Kia has never sold an estate version of its Mondeo-rivalling Optima. And that might go some way towards explaining why it’s never sold particularly well. Having cashed in on its seven-year warranty and exceptional value for money, Kia (along with sister brand Hyundai) is gradually attempting a move upmarket. When it revealed its Sportspace concept, it was clear change was on the horizon. Not only was the Optima-previewing concept absolutely drop-dead gorgeous (something the Optima has never previously been), it was also shooting brake in shape. 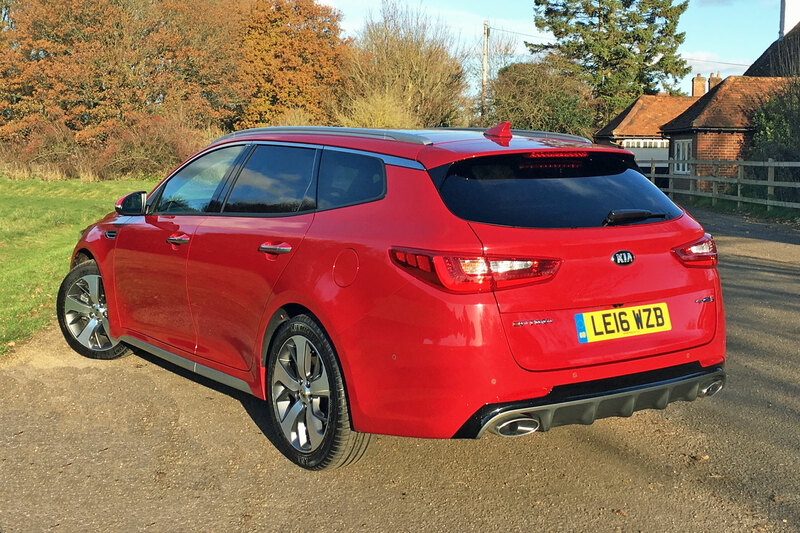 When Kia revealed the new Optima at Geneva 2016, it was no surprise, then, to see an estate (or ‘Sportswagon’ in Kia terminology – SW for short) in the line-up. In fact, the firm says it expects around three quarters of all Optimas sold in the UK will be the wagon. 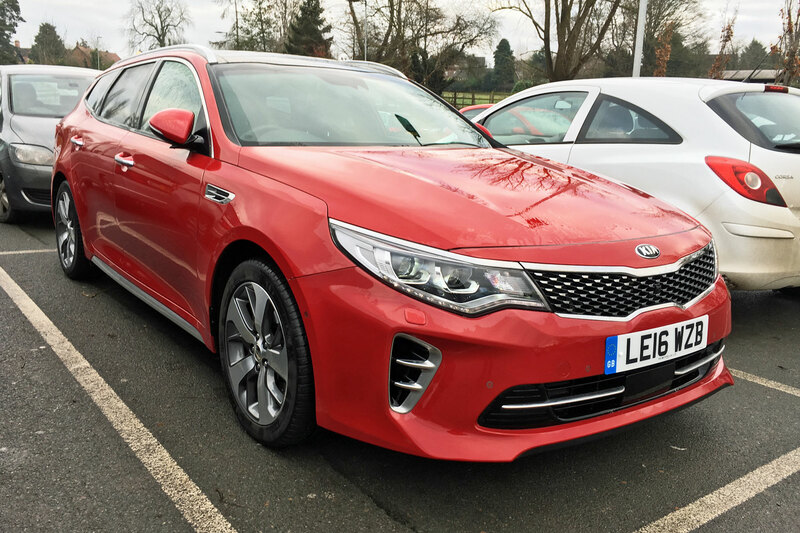 The new Optima SW certainly looks the part, but should you buy one over a rival such as the Ford Mondeo or Skoda Superb? We’re spending six months putting it to the test. I’ve done a lot of miles in the Kia Optima since I introduced it to the MR long-term test fleet. I could write a lengthy piece about how good it was for driving to Wales for Christmas duties (hence the picture of it looking filthy above), how a Nordic Fir slotted into the boot and how it copes brilliantly with the daily grind, but you probably know all that. 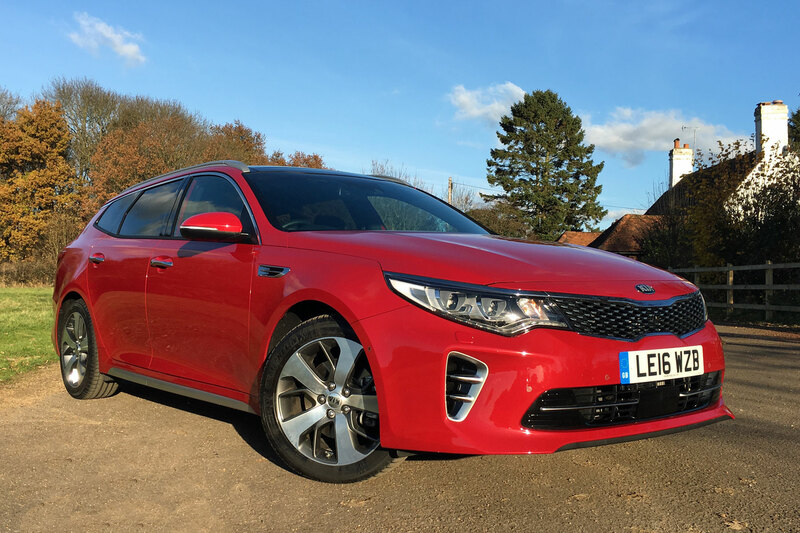 So I thought I’d do one of those trendy listicles about what I like and dislike about the Optima SW.
OK, it might sound like a silly, minor thing. All cars have relatively comfortable seats, right, especially if you spend more than £30,000 on the top-spec leather-trimmed GT-Line variant? Well, yeah, but I eternally find myself aching after a long stint in pretty much any Volkswagen Group product (I think I’m the wrong shape for German seats). In the Optima, I’m as fresh as the proverbial daisy even after a slog of several hundred miles. I’m no audio snob, but all grades of the Optima SW from the ‘3’ up feature a Harman Kardon sound system. The speakers (eight in total) do a commendable job of mimicking a premium car’s sound system. Combine this with Spotify through my phone (we’ll come onto that shortly…) and the Kia becomes a mobile disco. 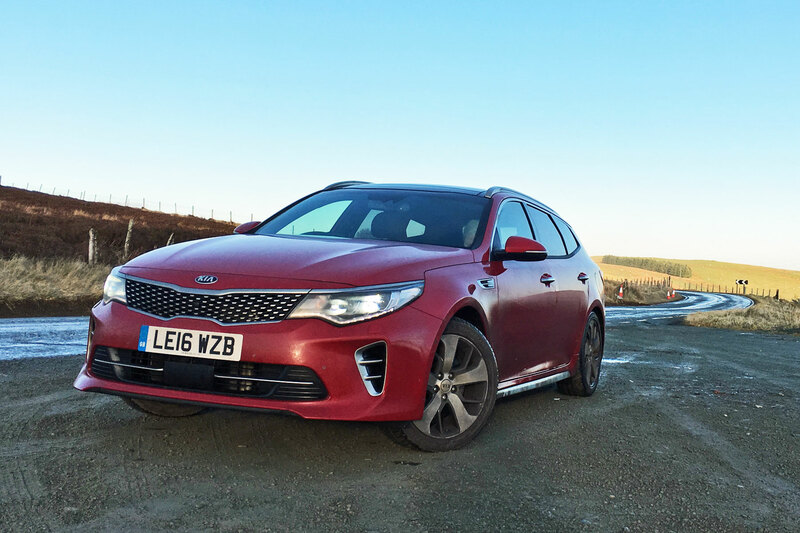 While rivals such as the Mazda 6 and Vauxhall Insignia stick with conventional automatic gearboxes, the Kia Optima gets a more upmarket dual-clutch transmission. This makes for faster gear changes – and it works brilliantly. Just don’t bother with ‘eco’ mode unless you’re motorway cruising (another thing I’ll come onto shortly). Finally, look at it. This doesn’t look like a downmarket offering – it attracts loads of admiring glances, especially in Temptation Red. While I’m not sure about the chintzy grille, the rest of it looks great – particularly from the rear. Turn the ignition on without putting your seatbelt on and it beeps. Run low on washer fluid and it beeps. Drive in cold conditions and it beeps. Stand near the boot and it beeps (before the electronic tailgate, standard on the GT-Line S, starts opening). I find beeps infuriating yet Korean and Japanese cars love them. At this time of year, cars get filthy pretty quickly. Normally I’m the sort who doesn’t bother cleaning their car over winter (what’s the point when it gets dirty again so soon), but the Optima’s reversing camera (standard on all models) and clever 360-degree around view monitor (standard on the GT Line S) means I’m having to clean the Optima almost weekly. The cameras get covered in the dirt extremely easily, and there’s no washer system like on some models. No, I don’t expect super-direct steering, but the Kia Optima’s steering is so light just keeping it on the straight ahead is a bit of an effort. Feedback is non-existent, while putting in sports mode makes things heavier but not particularly communicative. 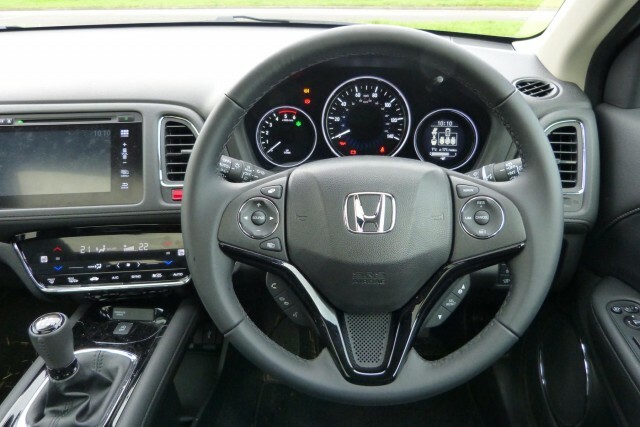 Talking of which: sports mode holds onto the revs for too long, while eco mode is frustrating – roundabouts particularly (“are you sure you want to pull out rapidly,” the car says, “think of the trees!”). Why can’t I have ‘normal’ mode with slightly heavier steering? I recently got a puncture in the Optima. 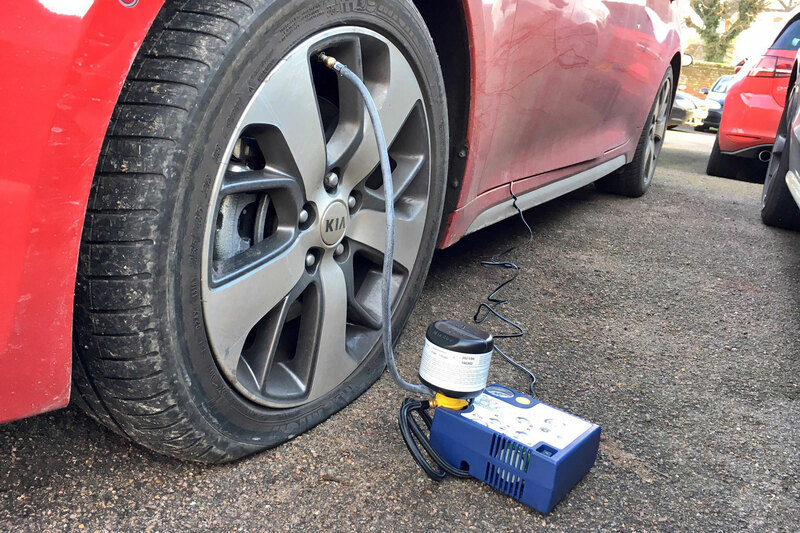 I can’t really blame the Kia for that, but I can blame it for having a rubbish ‘tyre mobility kit’ that only worked long enough for me to limp seven miles to my nearest ATS Euromaster. Said ATS Euromaster were too busy to fit me in for a couple of days, meaning I had to abandon the Kia in their car park and get the train. Give me a full size spare any day. I’m a huge fan of Apple CarPlay, and if I was a company car driver looking for an estate car to cover long distances, CarPlay would be high on the list of priorities. Curiously, the Optima Sportswagon is available with Android Auto but not Apple CarPlay. It’s on its way, apparently, but I do miss it on our long-termer. Car company bosses often seem ashamed to admit that they’re targeting company car drivers with a new model. The suggestion that private buyers won’t be stumping up their own cold, hard cash upfront for a car is frowned upon. Kia’s different. It accepts that business users make up the vast majority of buyers in this segment – no one buys a new Ford Mondeo for themselves. 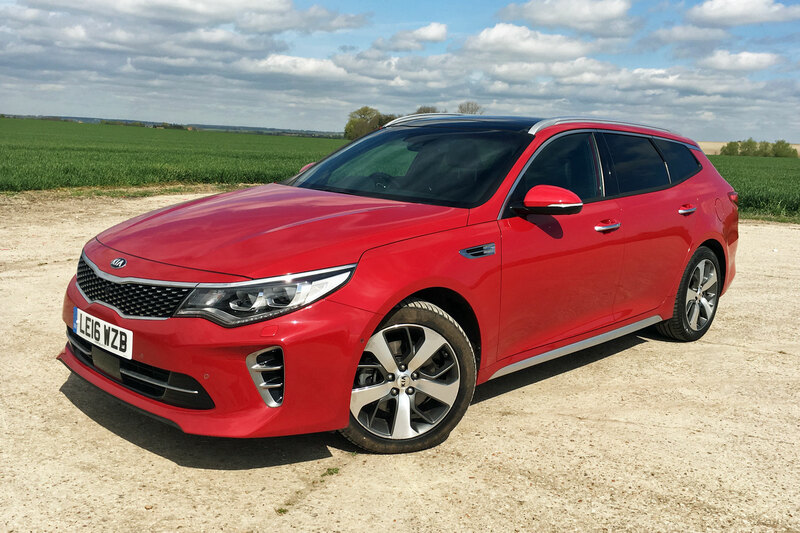 More than 80% of Optima buyers will be business users, and that’s why it’s kept things simple, offering just two efficient engines. You can pick from a 1.7-litre diesel (emitting 113g/km CO2, meaning 19% company car tax), or a plug-in hybrid (37g/km CO2). There’s no petrol, for now – although a high-performance GT is set to follow in 2017. We’ve opted for the diesel and, out of the four models on offer, we’ve chosen the top-spec GT-Line S. This comes with a seven-speed dual-clutch automatic gearbox as standard (resulting in a rise in emissions to 120g/km). With a £30,595 price tag, is it an overpriced Korean estate or a genuine premium go-getter? First impressions suggest this could be the car for shedding Kia’s ‘Asda Price’ image – it’s absolutely loaded with kit. Highlights include 18-inch alloys, an openable panoramic sunroof and an eight-inch touchscreen infotainment system incorporating sat-nav and Android Auto connectivity (but not Apple CarPlay, yet). It even has a wireless phone charger. Oh, and there are plenty of comforts to make the upcoming winter months more bearable: think heated front and rear seats, ventilated front seats (er…), and leather upholstery with red stitching. While the inside certainly does a good impression of a premium vehicle, the exterior makes many rivals look bland. With more than a passing resemblance to the concept on which it’s based, we’ve already noticed passers-by taking a second glance. That wouldn’t happen in a Skoda Superb. 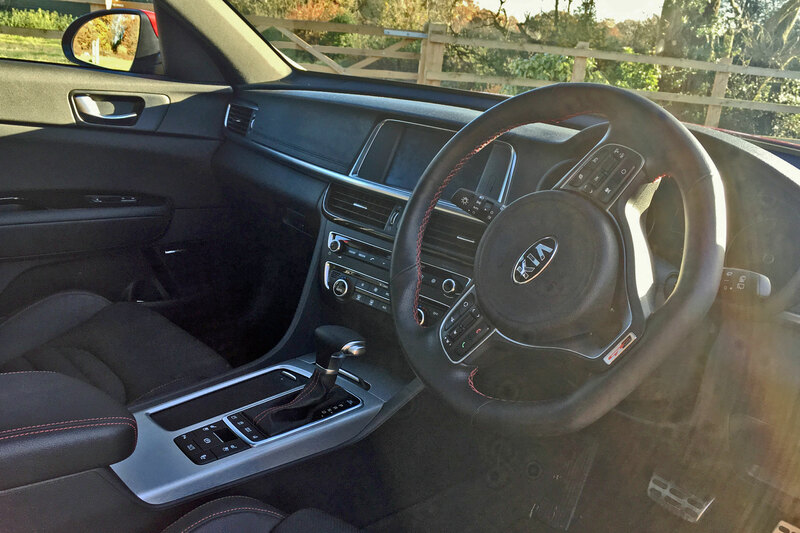 Will our positive first impressions continue as we spend more time with the Kia Optima? We’ll be living with it for six months to find out. It’s the end of January and there’s still no snow in the south-east of England. That will probably please a lot of crossover owners, because, despite the styling, their cars will be no better than a regular family hatchback when it comes to dealing with the white stuff. 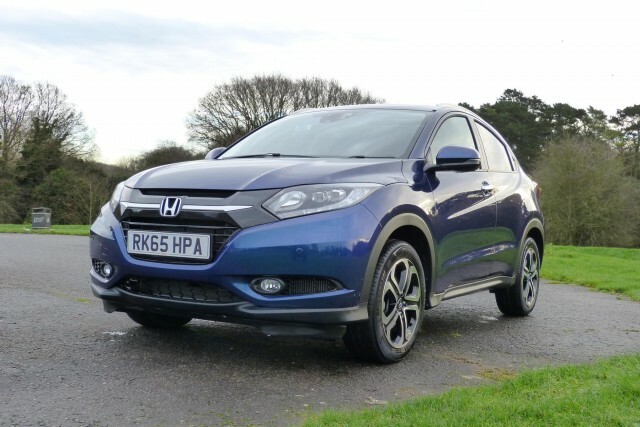 The HR-V is not even offered with four-wheel drive in the UK, which is a reflection of where Honda sees the real demand. It’s far more about style and space than off-road prowess, although a decent set of winter tyres will surely still see this compact crossover navigate itself out of most slippery situations. I left the HR-V at Stansted airport for a few days last week, using my usual meet-and-greet service. It seems to be the same as valet parking, except you have to walk a few yards more to get into the terminal – and it’s more wallet-friendly. The Honda, of course, disappears off to a distant car park, to be retrieved a few hours before my flight lands. This time I kept a note of the mileage and I reckon it hadn’t travelled further than one side of the drop-off-zone to the other. Yet it’s always worth doing a walk around to check for damage, as once you’ve left the airport, you are on your own. I have this theory that, in winter, diesel fuel is less calorific than in the summer months. The fuel companies add an anti-waxing agent to prevent diesel from thickening up in low temperatures, and in my experience this goes hand-in-hand with worsening economy. That’s certainly the case with our personal 2.0-litre Kia Sportage, but with the Honda the difference seems to be marginal. I guess that fact that the economy is now more commonly mid-fifties than high-fifties isn’t really much of a reason to worry. It means the HR-V diesel still an amazingly economical vehicle, and with fuel currently at 97.9p for a gallon, it’s makes for very cheap motoring. 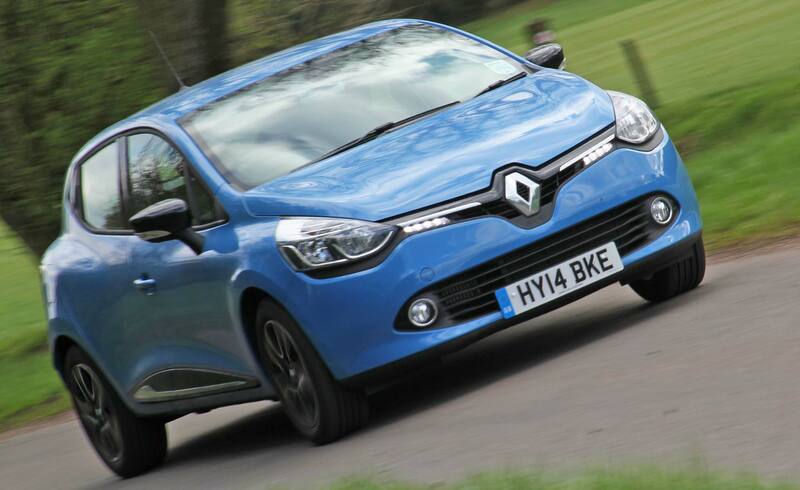 Report 23: 25 November 2014 – how far has the Renault Clio come? This far!